Liber Pater, the Roman god who presided over human seed, (as related by Augustine) was often seen as being Dionysos, as he was by Ovid that poet of becoming, for whom he was a patron god. After his banishment by Augustus to the what is now Romanian coast, a very remote place from a Roman perspective, Ovid wrote the Tristia, his Book of Sorrows. In Book 5, Ovid laments his inability to attend the convocation of poets on the Liberalia*, March 17th. The poets met to celebrate Liber/Bacchus. Ovid beseeches the god to bring him back through his own powers so he can join his retinue. It didn’t literally work out, but in the form of his book it did. A key image and episode in the Dionysian mythos is Dionysos’ leap from his chariot to console Ariadne, bereft and disconsolate by her abandonment by Theseus on Naxos (who wouldn’t be?). Ovid writes of this in his Ars Amatoria and in the Fasti as well. Professor Ned Lubacher, in Time-Fetishes: The Secret History of Eternal Recurrence, describes this vital scene as the god’s leap into presence and becoming as his heart stirs for Ariadne. Ovid says he leaps to her (and out of his chariot) so as to not let the tigers who draw his chariot frighten her. We see the god’s tenderness, this god who dies, and knows loss, as he approaches the Cretan princess. This leap will capture the imagination of Renaissance painters as well, as in Titian’s painting of this scene from 1533, Bacchus and Ariadne. 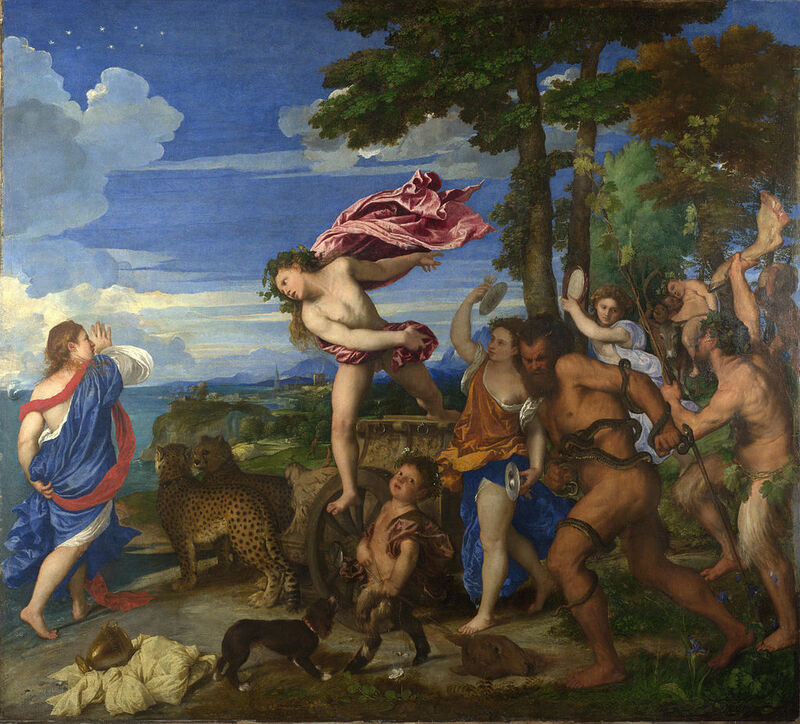 According to Lubacher, Titian was well acquainted with the Metamorphoses and “…understood that something essential about the relationship of Bacchus and Ariadne could be depicted only through the figure of the god leaping in midair to save the human from despair, from losing herself in the infinite distance which seems to stretch out from beyond Theseus’ ship…The leap and gaze pull her back from an imminent nothingness and into the cymbal-filled din of the bacchanal. In the sky above them the ring of stars appears enigmatically to suggest that all of this is about something esoteric: the ring of recurrence and the eternal cycles of becoming” (49). The ancient theology of eternal recurrence is embodied in these images. 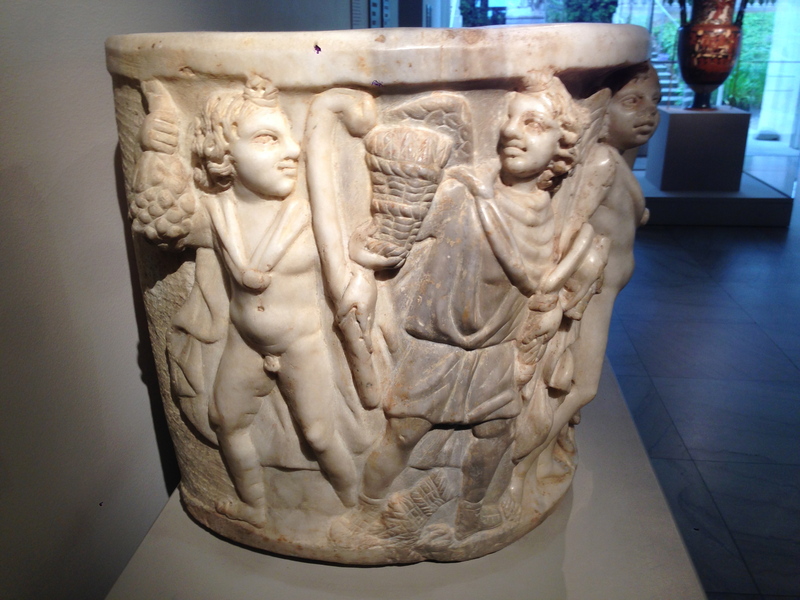 Dionysos/Bacchus’ restoration of Ariadne is a central image of sarcophagi for the Roman imperial period. As historians including Bruhl, Turcan, and Metz have shown, this story became a common, if somewhat esoteric one in that period for understanding death and the afterlife, and while for some it was simply decorative, these were expensive funeral works that were expensive to commission and for many of the families these must have provided a meaningful allegory (Lukacher 43). But love is the tone of these common images, renewal of life, specifically in the becoming of the senses, in the wine party with musicians about, and readiness to dance. Is the god’s leap the first step in his dance with Ariadne? In Titian’s imagination the retinue are dancing. As Ariadne is turning toward the god with a sense of significant movement, a very youthful Dionysos is the very picture of motion and vigor, his cape flows behind him in the great rush of becoming. Behind him are the famous Dionysian retinue: satyrs, erotes, maenads, and others. Historians Robert Turcan and Friedrich Metz have shown how key the episode of Dionysos rescuing Ariadne was to the understanding of death and life after death in the early centuries CE. In contrast to the promise of Jesus Christ to bring the faithful resurrection in a type of eternal stasis, Bacchus is pictured in these artworks as resurrecting the soul within the world of endless becoming, in the realm of the senses. 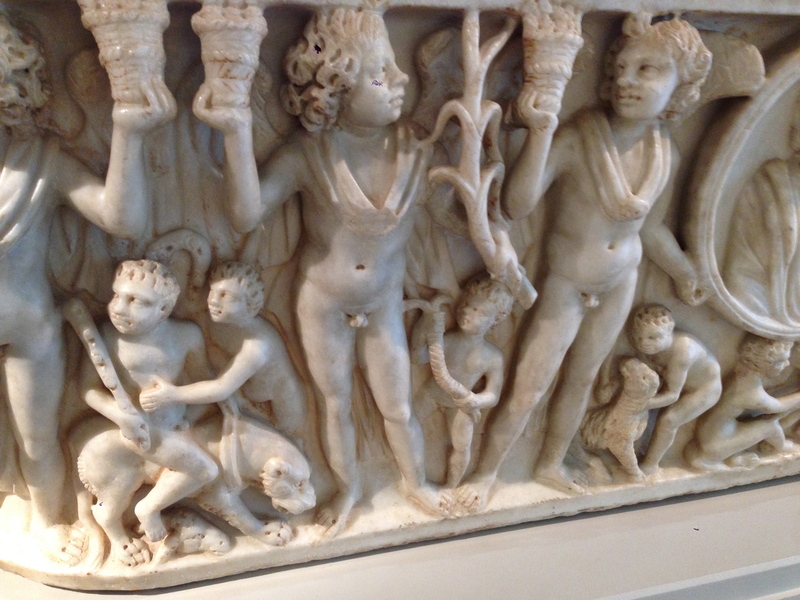 Roman sarcophagi with Dionysian motifs, Palace of the Legion of Honor, San Francisco. That great Dionysian, Friedrich Nietzsche who had probably viewed Titian’s painting, had planned to make his own contribution to the understanding of these mysteries in dramatic form. In his notebooks, he wrote a draft of a satyr play (which never was completed) and penned an evocative line from Ariadne’s perspective: “abandoned by the hero, I dream of the superhero” (KSA 10:433, quoted in Lubacher 47). Some years later still writing notes for the play, the philosopher writes from the point of view of Dionysos: “Oh, Ariadne,” says the god, “you yourself are the Labyrinth: one never gets out of you” (KSA12:510, Lubacher). Ariadne, the endless cycling dance of death and life twining through unimaginable gulfs of time in the cycles of becoming, always joined by the ecstatic lord; Ariadne whose brother is a monster; Ariadne, whose mother gave in to an unthinkable lust; Ariadne rent by an abyss of abandonment; Ariadne with Dionysus, who has died, suffered and is ever-reborn, leaping toward her! A lightening bolt. Dionysus becomes visible in emerald beauty. Now the god has become the labyrinth, which brings us back to the dancing ground. Carl Kerenyi saw Aridane as the Minoan Mistress of the Labyrinth, the Knossos Labyrinth being a sacred dance design. In what Kerenyi thought was an older story, Dionysos first took her as wife in the Labyrinth, about which Himerios (5th century CE) drawing on an earlier unnamed writer, says “In Cretan caves Dionysos took Ariadne to wife” (110). Ariadne is the labyrinth, where Dionysos continuously leaps into zoe too! As Kerenyi says, zoe, indestructible life, the endlessly becoming, “suffers no interruption and permeates all things” (95). Another view of the sarcophagi. In the Tristia written in the exile on the (now) Romanian coast, that alienation that Augustus had put upon him, Ovid calls to Liber, “come and lighten my misfortunes, fairest of gods, remembering I am one of thine own” (38). Ovid was the poet of becoming and its endless metamorphoses, the ever-shifting cycle of the great (cosmic) year; it should come as not surprise that he should write so beautifully of the leap of the ecstatic god to Ariadne. While Augustus never relented, at least within the power of his poem Ovid was able to rejoin the retinue of the God. *Scholars have various theories about the older Republican-era meaning of the Liberalia, and the centrality or not of Liber Pater in it, but among other things it marked the taking of the toga virilis by citizen boys (of 14) passing into manhood, which Ovid interpreted as a sign of liberty. Ned Lubacher. Time Fetishes: The Secret History of Eternal Recurrence. Duke University Press, 1998. Carl Kerenyi. Dionysos: Archetypal Image of Indestructible Life. Princeton University Press, 1976. Often it’s something subtle, a glow of light through leaves, a deeper shade, a resonance of bark, and the sense of something much greater and older imbues consciousness. And someone appears. Maybe a banana slug. A surprising creature moving ever so slowly, gliding in slow motion over the moss on a dead tree trunk in moist ferny forest. There are species that when they appear seem like a spirit of the forest. I should rephrase that, this humble creature surely is a spirit of the forest. Scientifically it is Ariolimax, an air breathing gastropod mollusk that lives in the moist cool redwood zone of coastal northern California and in the wet coastal forests all the way up to southeast Alaska (with a few limited relict populations further south and to the east in the Sierra Nevada). But through the lens of the animist it is something more, my experience of it is more than rationalist knowledge can contain. I’m not putting down that kind of knowledge (I find people always jump to such conclusions when any limitations to our dominant mode of rationality are stated) as it obviously informs my understanding of this creature that is the mascot of the University of California at Santa Cruz. 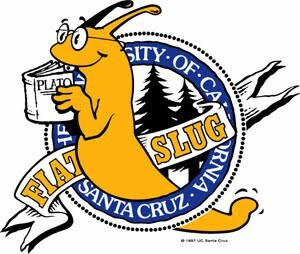 Note that the slug is reading Plato! 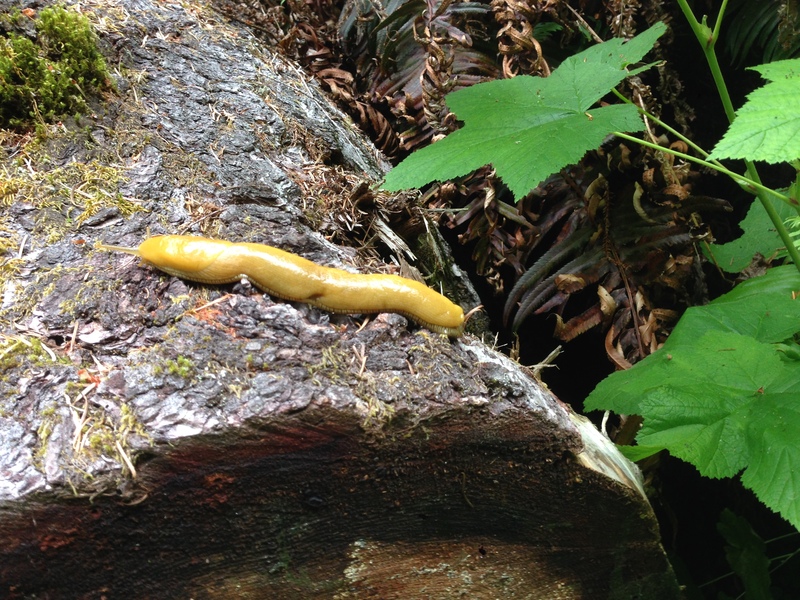 But there is something improbable about the banana slugs and their appearances; at least for me. I feel a kind of surprise; I who usually find garden slugs disgusting, yet these primal creatures of the forest elicit something like what the Japanese call yugen, reflecting something deep and hinting of unnoticed things. The Japanese poet Kamo no Chōmei (13th century) offers the following as a characterization of yūgen: “It is like an autumn evening under a colorless expanse of silent sky. Somehow, as if for some reason that we should be able to recall, tears well uncontrollably.” Or Nancy Hume writing in Japanese Aesthetics and Culture: A Reader writes, “When looking at autumn mountains through mist, the view may be indistinct yet have great depth. Although few autumn leaves may be visible through the mist, the view is alluring. The limitless vista created in imagination far surpasses anything one can see more clearly” (Hume, 253–54). The Beat poet Hettie Jones (and first wife of Amiri Baraka) had a literary magazine in the ‘50s called Yugen, with the emphasize on surprise, paradox, like the classic yugen image of a tree growing out of rock, the unexpected, the richness of emotional perception, awe. I would say chains of relationships, of time, of the exceptions, braidings and weavings of life are evoked. The ecologist Aldo Leopold, who was an advisor on conservation to the United Nations and died in 1948 in a grass fire, used the term noumenon, an imponderable essence of material things. He writes of how in the north woods autumn landscape consists of “the land, plus a red maple, plus a ruffed grouse. In terms of conventional physics, the grouse represents only a millionth of either the mass or the energy of an acre. Yet subtract the grouse and the whole thing is dead. An enormous amount of some kind of motive power has been lost (A Sand County Almanac, 137). He goes on to mention various birds who are the noumenon of different landscapes like the Thick-billed Parrot of the Sierra Madre. 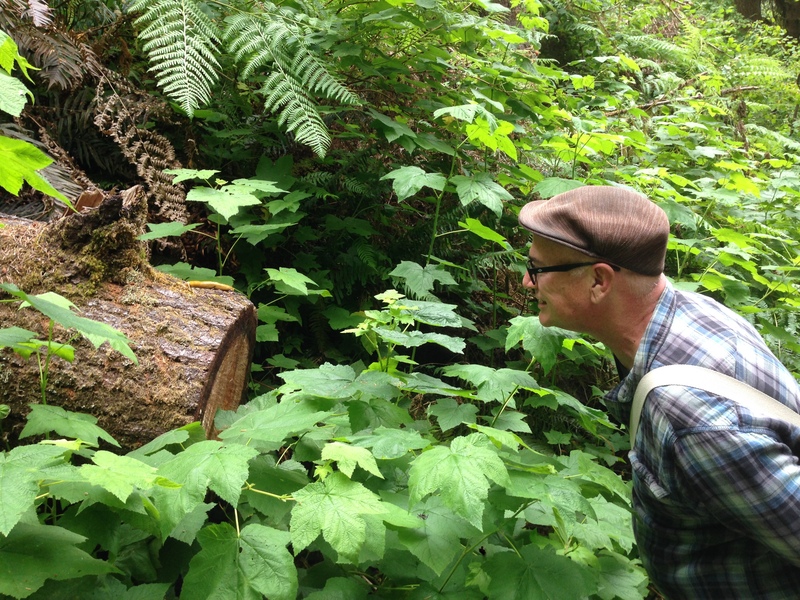 I’d say the Stellar’s jay is one in the redwood forest, but so is the banana slug, that humble invertebrate, flashing yellow in the dim woods, gliding slowly, but determinedly down through the ages. 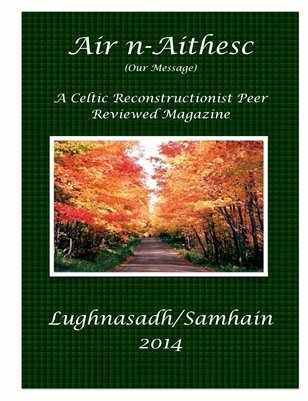 Volume 1, Issue 2 of Air n-Aithesc (Our Message) is now available both in print and digital editions!